Before leaving home I searched the Internet for free and inexpensive things to do in Las Vegas. That's how the Bonnie Springs Old Nevada web site popped up. And I'm glad it did. It's a replica of an 1880 mining town where shows are staged on weekends and holidays. 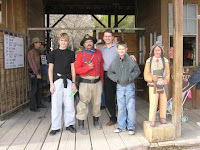 We visited it on Christmas and for only $10 we saw a melodrama, a gunfight and a hanging, visited a wax museum, saw what school was like in those days, walked through a mine, were imprisoned for a while, were scared by a baby rattle(snake), rode on an old train, my younger son participated in a posse, the older one was held hostage by Mad Dog, the bad guy, and had to sing at gunpoint. We enjoyed ourselves immensely. This was the Wild West we wanted to see.